The Pattonville boys’ basketball team lost its district playoff game Tuesday night 71-66 against the Hazelwood Central Hawks (25-2). The Pirates finished with a season record of 7-12 proving to be mediocre compared to last year’s team. The 2016-2017 squad featured Destan Williams (Southwestern Illinois College) and Richard Henderson (Austin Peay) who led the team to an 18-8 record and a district championship before losing to Chaminade in the first round of the state tournament. This Class 5 District 2 semifinal game was definitely a fight for the Pirates but they were no match for the Hawks. The Hawks have only lost two games all year, falling to just Rock Bridge (Columbia, Missouri) and Chicago Orr (Chicago, Illinois). Xaiver Ball and Cameron Williams both had 16-point nights for the Hawks and Derrick Boyce III was the leading scorer for Pattonville totaling 23 points. Andre Webb also had a great night with 8 points. The season was definitely long and a struggle for the Pirates. Not only could they not win, but they also had many different injuries and grade issues as well. Star player Julius Erby tore his ACL during tryouts week at the beginning of the season and starting guard Shawn Brooks tore his MCL about a month ago. There were also a few students that had grade issues and a few students that left the team for various reasons. There were not too many bright spots of the season this year other than Derrick Boyce’s 20-point outings but the varsity squad did have one interesting story. Senior Ezra Jakob was a foreign exchange student from Antwerp, Belgium, and had come to Pattonville for the school year. He played basketball back home in Europe and he had a few thoughts on how playing basketball in the States compared to hoops in Belgium. 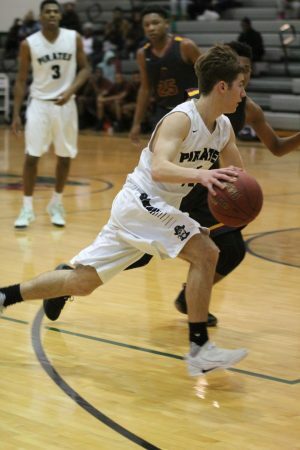 He also commented on how Belgium has a different athletic setup than the U.S.
Jakob had a solid year for the Pirates being a role player on the squad and starting about half of the games played this season. There were seven seniors on the team and most of them are going on to pursue a college sport. Mario Rowland and Larry Washington will be playing football together at Iowa Central Community College and David Ellison and Dakari Streeter will be playing on the gridiron at Missouri Western University. Lastly, Derrick Boyce will be pursuing his football and academic career at Butler Community College in Kansas. This season will honestly be a pretty forgettable one, but the only thing you can do is move on to next year. There is a lot of young talent on the team and the future looks to be bright for the Pirates. Now, the varsity coaches and returning players have 243 days to prepare for the 2018-2019 season. The basketball program can only go up from this point on. Sad to see the Pirates only had 19 games this season, compared to the 26 games last year.